Here in Southern Florida we have had a very bad Love Bug season. We were hoping it wouldn't be bad due to all the frost over the winter months, but no such luck. We came across 4 guys who really got hit hard traveling thru a rural area. 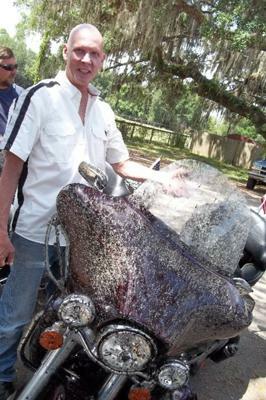 A State Trooper had asked them to stay off the road because car drivers windshields were so impaired by the bugs they had actually ran over several bikers the past week. They heeded his warning and were heading home. Here is one of the guys. Ah, I remember it well. Those suckers hurt at 75mph when all you're wearing is a t-shirt! Wow, we just spent a month on the FL roads, put 2,565 miles on our bikes. Glad we missed the bugs.